FreeSlot.com was already the biggest and best free slots site on the internet and now the world’s largest free online slots tournament site is bigger and better than ever. There are more free slots games to play and more free tournaments awarding cash prizes. 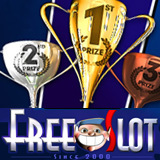 As of this week, FreeSlot.com has paid out a total of over $200,000 in real money winnings thanks to the ever growing selection of free slot games. “Sometimes free games are rubbish, but these are really cool,” said one skeptical player who became an immediate Freeslot.com fan when she entered her first free slots tournament. In daily tournaments, Freeslot.com players win $10, $25 and $50 cash prizes and the top ten scorers are permanently listed on the leaderboard. If they’re not satisfied with their score, players can play up to ten times to gain a better score and rank higher in the tournament. Many friendly rivalries have developed between regular players. In yesterday’s tournament, Diana A. scored 1860 points and won the $50 first prize. Second place Carolyn S. earned 1334 points and won $25 whilst Karen V. won $10 for her tournament score of 1290. Today’s designated tournament game is Tropical Treat. Tomorrow it will be one of the other free slots games: Lucky Go Round, Heavenly Reels, Win A Fortune, Wheeler Dealer or Vegas Mania. Delighting online slots players with free slot games since 2000, Freeslots.com offers more free slots tournaments with cash prizes than any other free slots site. check out my YouTube channel: http://www.youtube.com/OnlineSlotsNews.